Fever is a common medical condition that is defined by having a temperature above the normal range. This can be a signal of possible health problems and infections. It can also be caused by the reaction of the body to certain vaccinations, especially in babies. Doctors generally consider the body’s normal temperature between 97 to 100.3 degrees Fahrenheit (36 to 38 degrees Celsius). Temperature higher than normal should cause parents to worry and take necessary measures. Moderate fevers can be managed at home as long as the infant is kept hydrated and rested. However, babies suffering from extremely high and persistent fevers should be given immediate medical attention. It is therefore important to take the temperature a few times within a day to verify the condition of the baby. Fever can be treated at home. Several home treatments are guaranteed safe and effective for use to relieve the fever. The various ways below will ensure that the baby’s conditions are well managed and that the baby is kept comfortable and calm. Babies can be bathed as long as the lukewarm water is used. This may help reduce the body temperature. Never use ice baths, cold water, and even alcohol as these may gradually reduce the temperature, leading to more serious health problems. Additionally, alcohol may lead to poisoning if absorbed through the skin of the baby. Dress the baby in lightweight fabric clothes. Avoid layering as it will trap the excess body heat produced by the fever. This will also cause the baby to stay warm, leading to the continuous rising of the temperature. However, if the baby starts to shiver, an extra layer can be added to prevent catching a chill. How to bring down baby fever? Lessen the physical activities of babies. Too many movements will cause the body temperature to continue rising. Be sure to stay indoors and to keep the baby comfortable and calm at all times. Babies with fever should be kept well hydrated. Body fluids may be lost due to too much sweating. Sources may vary from breast milk to infant formulas. Supplementation with a small amount of water and natural fruit juices may also be okay if the baby is six months old and above. There are also commercially available electrolyte drinks that can be given to babies to keep them cool and make them feel better. The baby should be kept in a cool, comfortable, and well-ventilated room. Recommended room temperature is between 70 to 74 degrees Fahrenheit. A fan can also be placed to help in the proper circulation of the air. How to bring down baby fever? If the baby’s fever does not respond to non-medicinal treatments, consider giving acetaminophen. Precautionary measures should be given especially to the dosing instructions. Consultation from a medical doctor is highly recommended prior to giving this medication. The continuous rising of temperature may be alarming and dangerous. These can cause seizures and other serious problems. Medical help should be given to babies to ensure their safety and recovery in the following conditions. Babies less than 1-month-old with a rectal temperature of 100.4 degrees Fahrenheit or higher should be given immediate medical attention in a medical facility or emergency room. Babies less than 3 months old with a rectal temperature of 100.4 degrees or higher should see the family doctor or pediatrician. 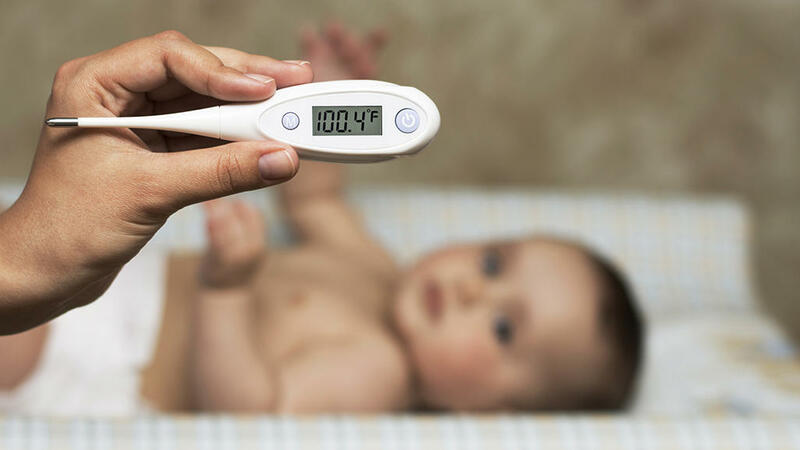 Babies between 3 to 6 months old with a temperature of 101 degrees Fahrenheit or higher should follow the advice of the doctor or the doctor’s “fever policy”. It states that there is no need to call a doctor if the baby appears to be playing normally and taking enough fluids. However, if high fever persists for more than 24 hours and is accompanied by other symptoms, the doctor should be called. Fever in babies may be a bit scary and alarming, let parents wonder about how to bring down baby fever. But parents should not panic and worry as there are immediate treatments that can be done to keep the baby calm and feel better as listed above. Knowing when to see a doctor or medical help is also needed for avoiding any serious problems. Always be cautious and stay alert to ensure the wellness of babies at all times.